Oklahoma City-based Devon Energy Corporation’s third quarter ended on a positive note, with $228 million in net earnings, or 43 cents a share, for the third quarter of 2017, according to a company press release issued on Tuesday. 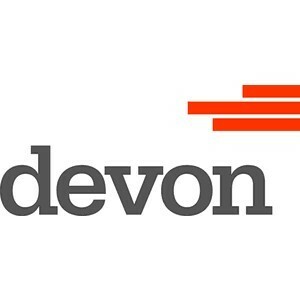 This figure is down sharply from $993 million, or $1.89 a share, in the third quarter of 2016, when Devon declared nearly $1.4 billion in revenue from asset sales. The company highlighted its 50 high-rate wells brought online with average rates exceeding 2,100 Boe per day; divestiture program hit $420 million of asset sales; free cash flow increased cash balance to $2.8 billion; capital expenditures were 12 percent below guidance year to date; and production exceeded midpoint of hurricane-adjusted guidance. Devon’s net production averaged 527,000 oil-equivalent barrels (Boe) per day for the third quarter of 2017, down from 577,000 Boe from a year ago. This result exceeded the midpoint of the company’s Hurricane Harvey-adjusted guidance by 6,000 Boe per day. Oil accounted for the largest component of the company’s product mix at 44 percent of total volumes. The majority of the company’s production was attributable to its U.S. resource plays, which averaged 403,000 Boe per day during the third quarter. 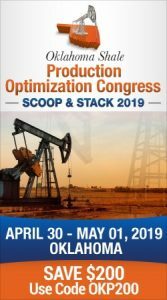 Storm-related curtailments reduced production in the U.S. by approximately 15,000 barrels per day (65 percent oil) in the quarter, with the most significant impact in the south Texas Eagle Ford play. The strongest asset-level performance in the quarter was from the company’s STACK assets, where production advanced 26 percent compared to 2016 exit rates. In Canada, net production was at the top-end of guidance averaging 124,000 Boe per day during the third quarter. A maintenance event at Jackfish 2, completed over a three-week period in July, curtailed production by approximately 15,000 barrels per day in the third quarter. Devon’s Jackfish complex has returned to pre-turnaround production levels and exited September at rates that are 24 percent above nameplate capacity. Devon continued to make progress in paring down its properties. In the third quarter, the company’s divestiture program progressed with an additional $80 million of asset sales, increasing overall proceeds to $420 million to date. The most significant asset remaining within this divestiture program is select leasehold within the Barnett Shale focused primarily in Johnson County, Texas. Initial bids are expected during the fourth quarter. Production associated with the Barnett Shale assets in Johnson County is approximately 30,000 Boe per day. Due to the closing of the Lavaca County assets at the end of the quarter and other minor asset sales, Devon’s fourth quarter production is expected to be reduced by 5,000 Boe per day (60 percent oil).